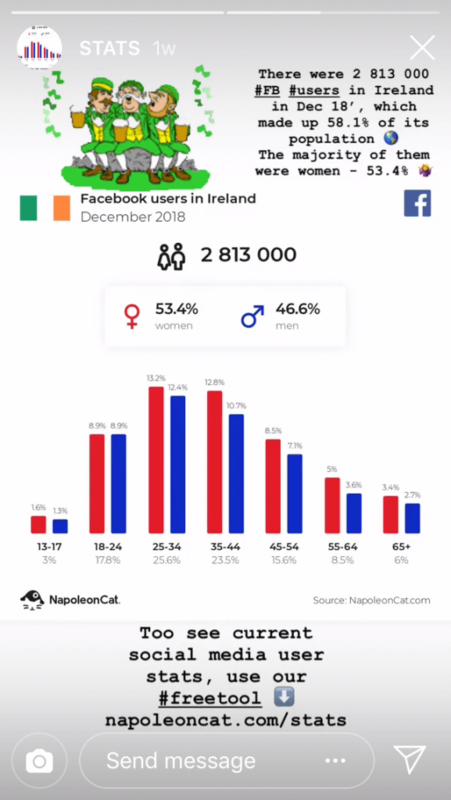 There are 400 million users watching Instagram Stories daily. 80% of all daily active Instagram users flick through Stories as often as they check their feed. 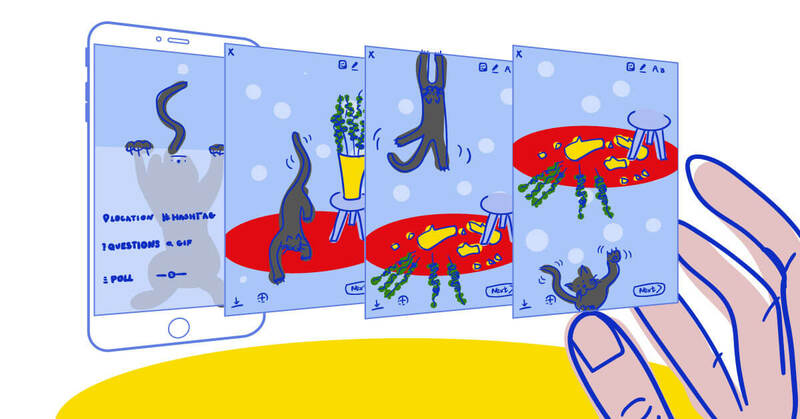 Big brands are investing more and more in Instagram Stories – why? Because we all love a good story. 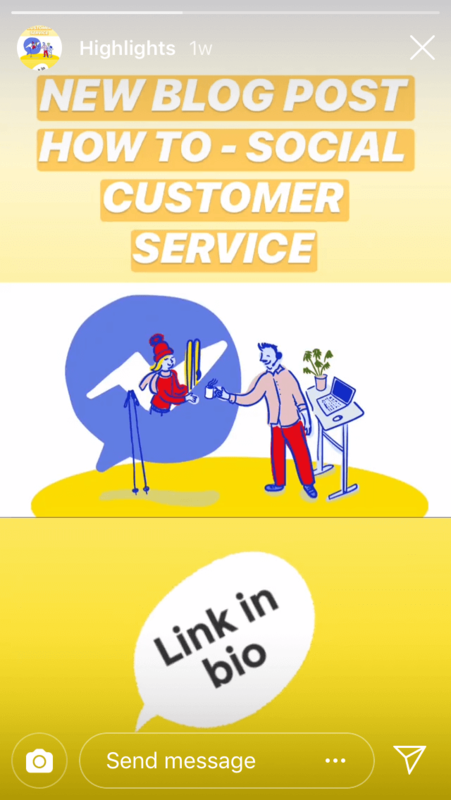 Instagram Stories can be a formidable weapon in the hands of a marketer. They let you build anticipation, drive traffic to a website, showcase your product, go behind the scenes of your business, get feedback from customers and more. Social media users love to know more about a company than just their product. They also rate video content and a good user experience. Stories give you a chance to show the human side of your business. With 15-second Story clips, you can make e.g. 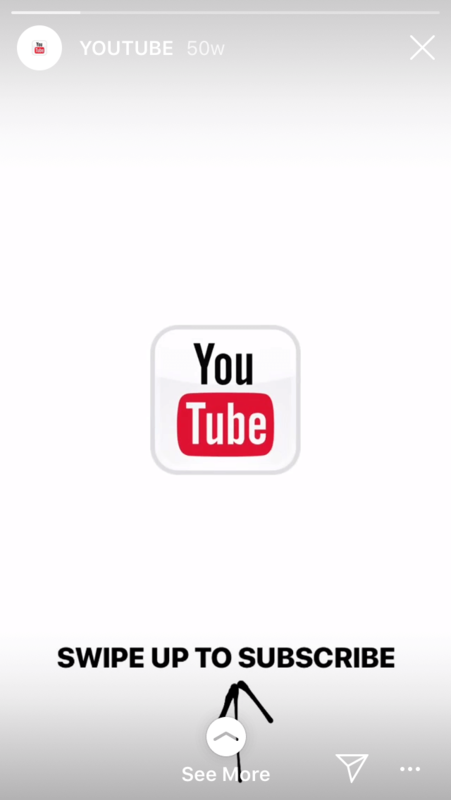 a day-in-the-life type video and you will get more views and user engagement than with a traditional post. If you film yourself or others, keep in mind that body language is crucial. Act natural, friendly, and most importantly, be authentic. People will know when you’re faking it. 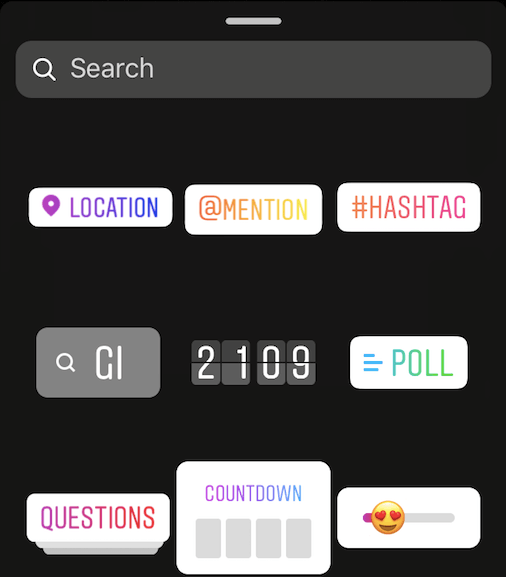 Instagram Stories can build anticipation for whatever you’re about to promote or drive traffic to. You can introduce your team members, showcase your headquarters, create a meme…The stage is all yours. Here’s blogger and author Tanya Hennessy taking it a little less seriously behind the scenes of a photoshoot. If you’re a small business and want to gain recognition locally, you can use geotags and be more visible in your area. Tag people or other businesses e.g. if you’d like to thank them for something. The tagged users get notified and are then able to repost your Story in the blink of an eye. It can also work the other way around when others tag your company. Users browse by hashtags, and that includes Stories, so you can get some more traffic. There’s pretty much a GIF for anything, however people usually add them to sprinkle some humor on their content. Great source of feedback, you write a question and you also set 2 fixed answers. Another great feature to interact with your potential customers. They ask you questions, and you answer them. You can then share your answers publicly or in a private message. These are great if you want to measure how your customers feel about something. You simply pick an emoji and the rest is done by the people. I like to call this feature emotion indicator. These can help you build anticipation for an event. You’ll be notified if anyone turns on their Reminder or shares your countdown on their own Story. A whole bunch of options to add to your Story and make it stand out. 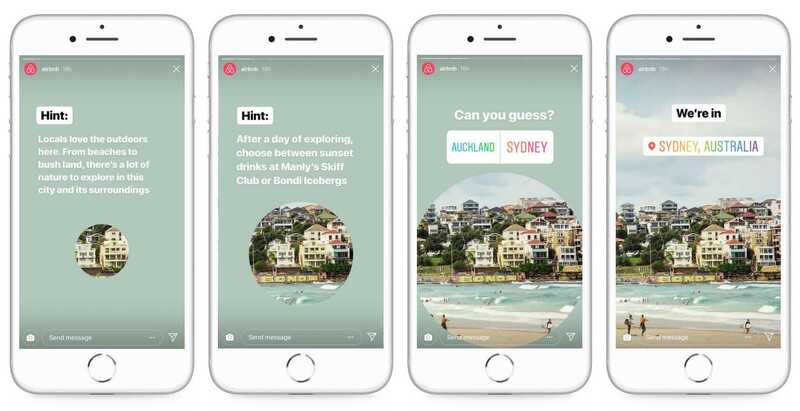 AirBnb not only entices users to continue watching their Story by slowly unveiling their landscapes, they also engage people to take in part in guessing where the pictures were taken. Carrigan Farms located in Mooresville, North Carolina uses geotags to show local Insta users how much fun people have at their facility. 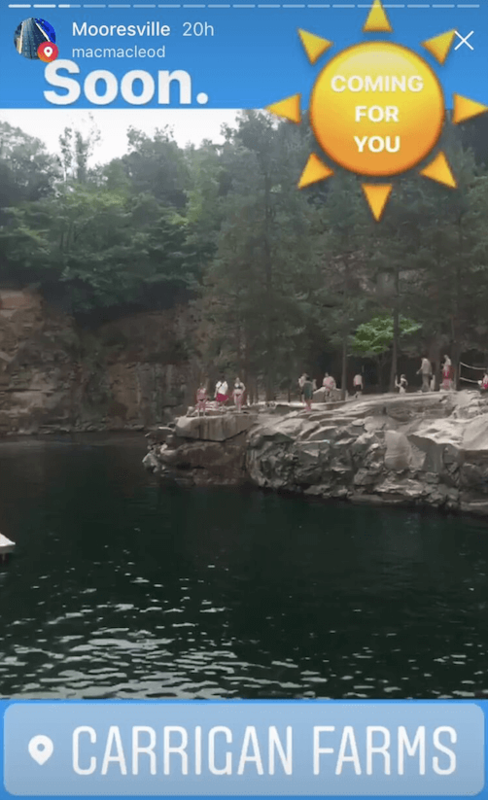 One of them being this cliff jump. Pretty rad. 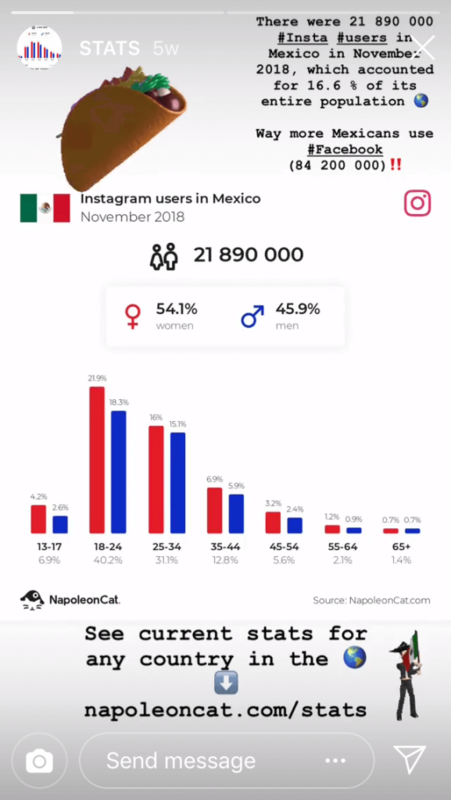 We upload social media user statistics on Insta Stories every day. We try to make them a little more compelling by using GIFs relating to the countries we provide data on. Your Instagram bio is limited to 150 characters. That’s really short. You can only put 1 link in there. However, with the feature of highlighted Stories, you can include a lot more useful information. You can add different groups of Highlights, e.g. your product, your team, your workspace, etc. 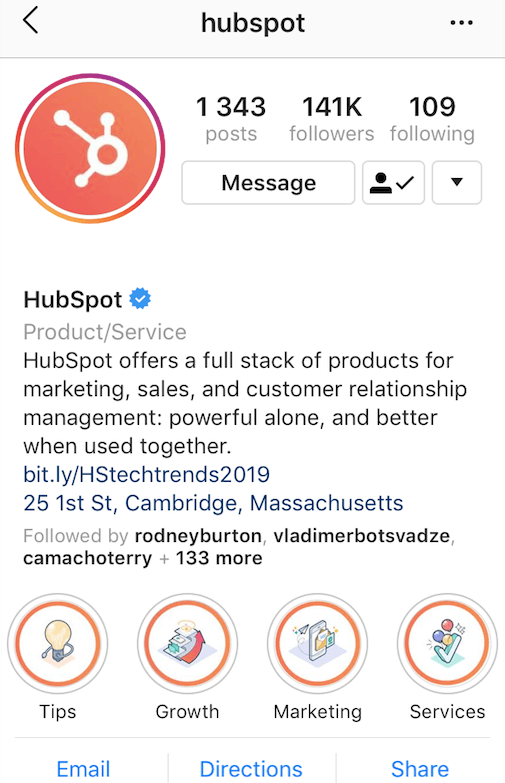 HubSpot is a great example. Recent feature also allows you to choose a thumbnail for a certain Highlight straight from your gallery. If you have +10k followers, you will be given the luxury of being able to include a link in your Story. People swipe up and they are then redirected to that specific web address. Keep in mind that it’s more than worthwhile to encourage them to swipe up with arrows, GIFs, or some additional text, as the default “see more” option appears rather small and can go unnoticed. Bike magazine RideBMX uses text and draws arrows with markers so that people know to swipe up. Less direct links surely have their downsides. However, users who take their time and effort to make those few extra clicks also have a higher probability of making a purchase, as they’re usually more interested in what you have to offer. Like I said, the stage is yours. There’s seriously so much you can do with the Stories feature. You can get as creative as you’d like and that’s the beauty of it. Don’t sleep on it. Need a tool to analyze your Stories’ performance? Start your FREE 2-WEEK TRIAL and conquer social media. Internet marketing master student at Warsaw School of Economics. I ride BMX, represent some cool companies and help them run their social media. I am a huge MCU fan and can't wait for Avengers Endgame.